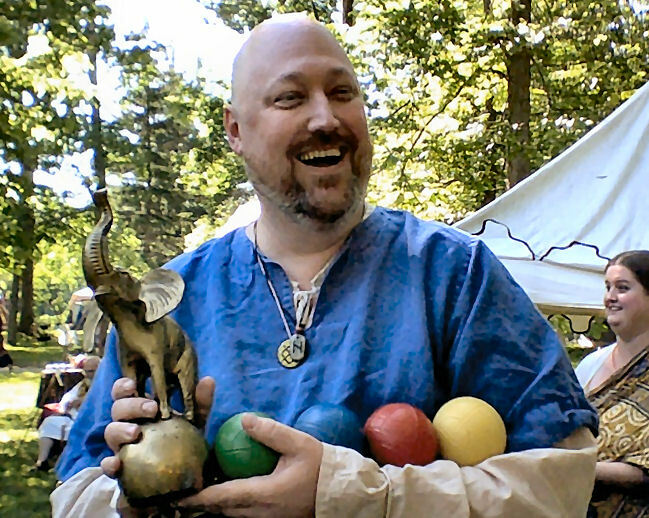 THFool Dagonell the Juggler provided this report of the Northern Oaken War Maneuvers in the Barony of Cleftlands, Middle Kingdom, which was invaded visited by a substantial number of gentles from Æthelmearc. 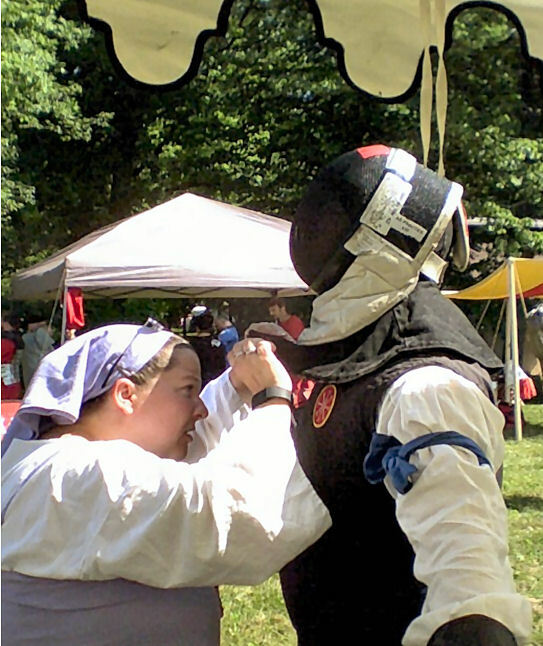 As dusk fell on Friday night, activities began with a Twilight Tourney for rapier, a Torchlight Tourney for armored and a Shakespearean Puppet competition for the non-martially inclined. The sawdust smack down was judged by THL Elizabethe Alles, Baroness Verena Entenwirth, and Lord Pietro de san Tebaldo, and saw entries from Henry V, King Lear, several sonnets, and the Taming of the Shrew. One audience member said, “I’ve never laughed so hysterically at King Lear!” The King Lear performance was, in fact the winner having been put on by Lord Walter Glatz and his (newlywed!) Lady Sarah. After the formal competition was over, the senior puppeteers gave a few impromptu puppet tutorials, and allowed participants and audience to play with a real puppet stage. The European Ball didn’t quite come together as gentles were tired with long drives, camp set-ups, and competitions, and instead quietly talked in the main pavilion until all hours of the night. In the morning, the Breakfast Tavern opened with a filling breakfast of oatmeal, eggs, sausage, coffee and coffeecake for only $4. All lists, ranges and fields opened for inspections, authorizations, practices, and pick-ups. Ranges, lists, and fields opening for the day. Sir Otto of Westphalia (Rhydderich Hael) armors up for the heavy list. While Lord Jacob of Dunmore (Heronter) armors up for the fencing list. 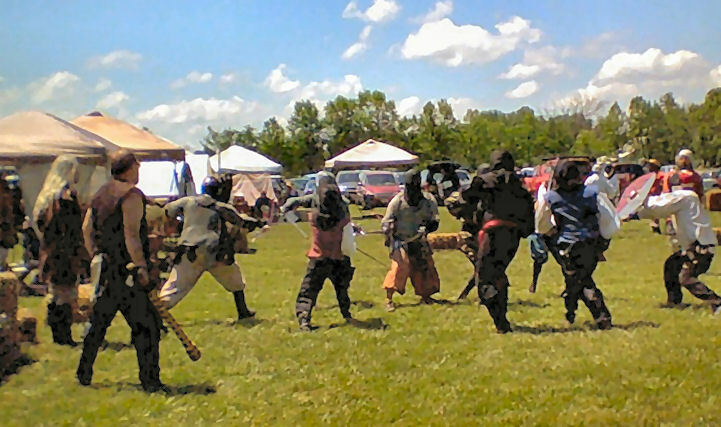 In the First Heavy list there was a 6′ Spear Tourney which was won by Duke Maynard von dem Steine (Rhydderich Hael). 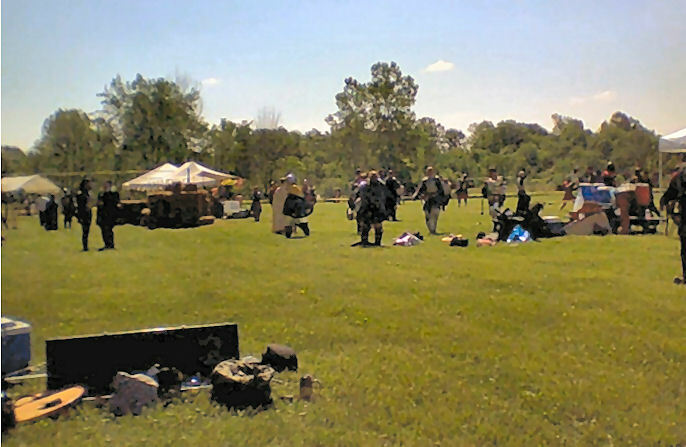 A Novice Tourney was held in the Second Heavy List. In the First Fencing List was the Northern Oak Rapier Championship, while the Second Fencing List ran the NOT The Northern Oak Rapier Championship! 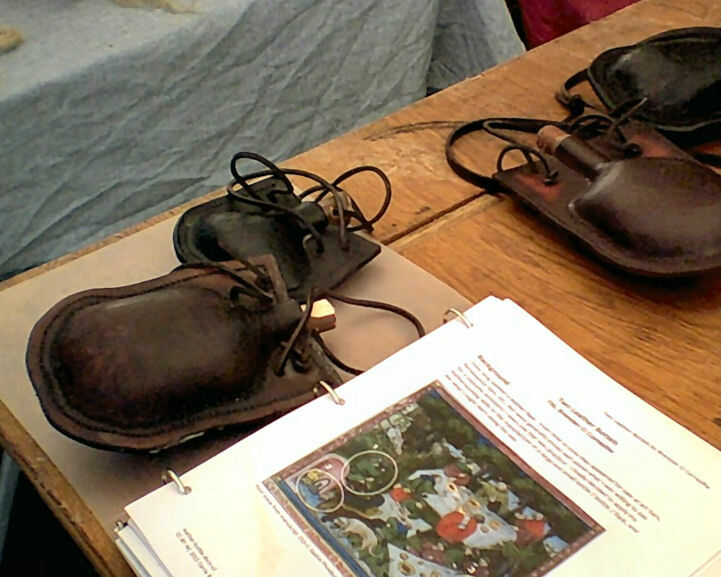 Artisans’ Row had some truly wonderful goods, including Dominica’s Fine Fashions from Æthelmearc. I bought some wonderful homemade mustards from THL Edward fitz Ranulf, who got his Dragon’s Heart later that evening. 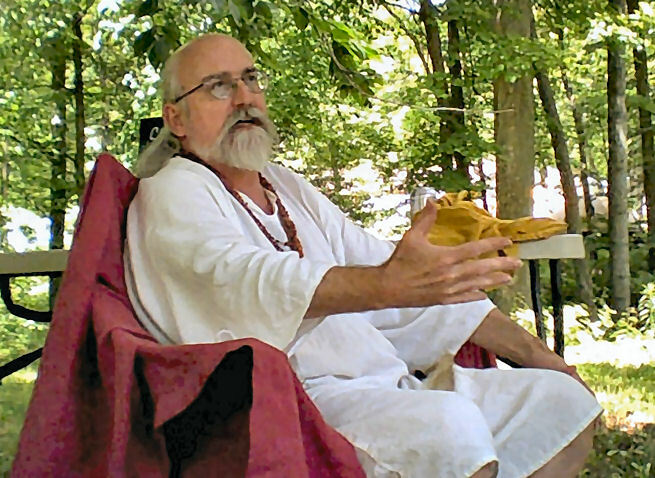 We learned that a small accident had occurred the night before: the proprietor of Magic Carpet Kavehane pinched his hand between a trailer hitch and trailer ball and had to be taken to the hospital for stitches and then sent home. 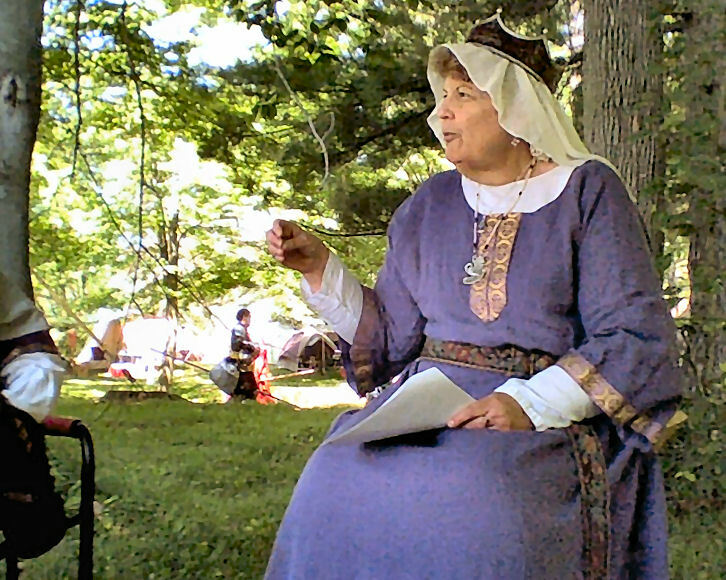 Classes to be held at the Kavehane were cancelled, so Dominica graciously took over as Merchant Liaison for the site, and the bards took over running the NOBLE competition so his lady could attend him at the hospital. 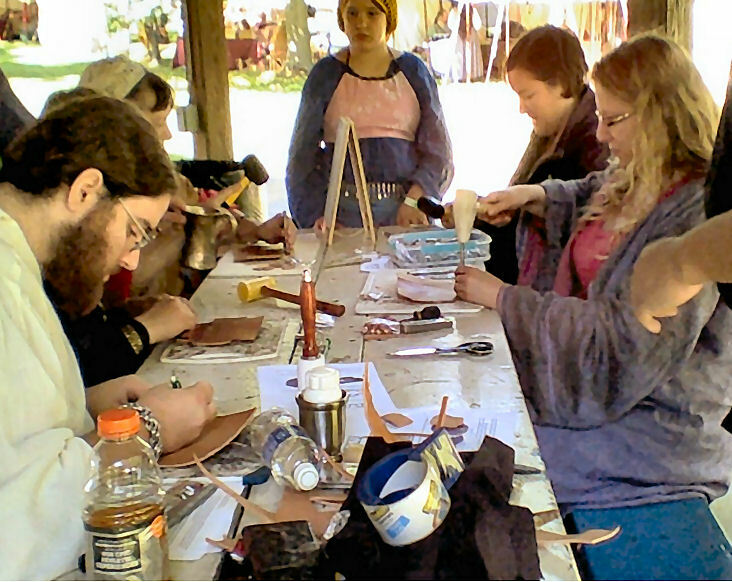 Classes offered that day included How to Make a Mary Rose Archery Bracer; Flax Processing: From Plant to Cloth; Intro to the Forge; Intro to Cloisonné Enameling; The Life and Times of our Boy Will (Shakespeare); Tortoise Shell Brooches and Temple Rings; Fiber Arts for Youth; Your First SCA Event; Rus Clothing; Out Damned Spot (Medieval Laundry techniques); Bardic Teaching Circle; Norse Gods: Aesir and Vanir; Norse Spirits: Trolls, Giants, Elves and Dwarves; Leather Art; From Page to Performance; Share the Love: Tokens of Appreciation; Death Becomes Her; Bayeux Tapestry Stitch Basics; Norse Apron Dress Concepts; Equestrian 101: Getting Involved with Horses (there were no horses on site); The Arte of Making the Medieval Bed (taken from a 15th c servant’s manual); and Calf to Codex. 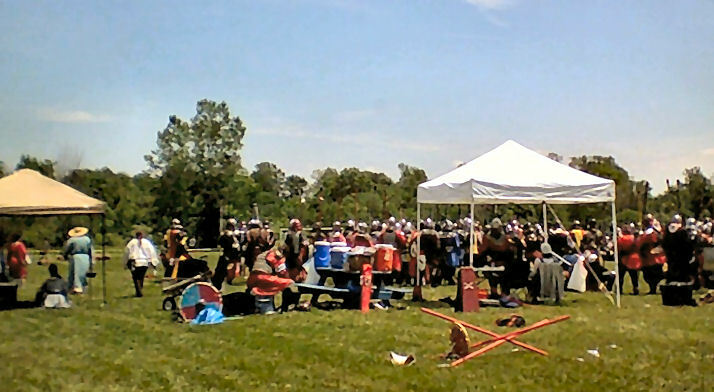 The battlefields were also busy with The Grand Tournament of the Salamander, Melee Practice, an Unbelted Battle, Bridge Battles, Open Field Melees, Novice Rapier, and many pickups. 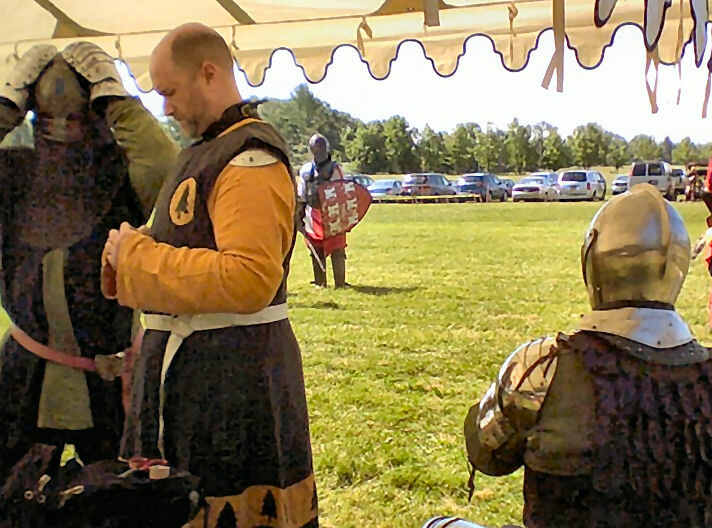 Sir Steffan Ulfkelsson lead Æthelmearc’s troops as the Rattan Army Warlord. As reported previously on the Gazette, Æthelmearc fielded 60+ fighters, and with its allies won three out of five field battles, two out of three bridge battles, and the gate battle. Vivant! 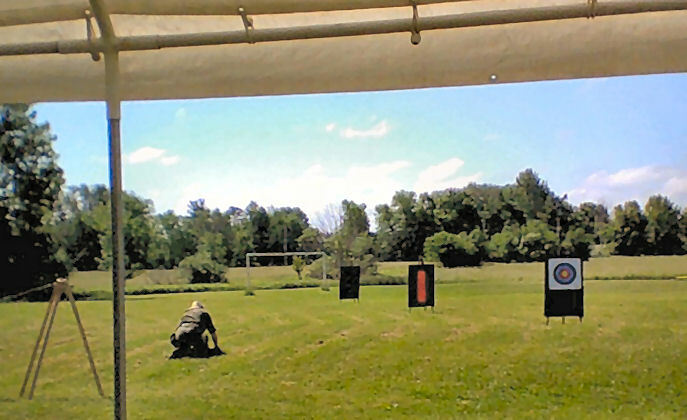 The archery range was equally busy with Royal Rounds, Youth Shoot, Northern Oaken Regional Championship Archery Shoot, Thrown Weapons Tourney, Youth Thrown Weapons Tourney, and a Novelty Shoot. 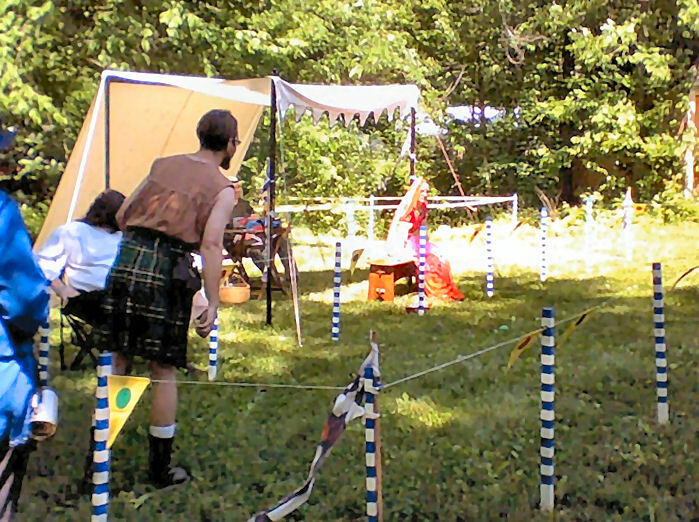 Northern Oaken is also home to the Baroness’ Bocce Tourney. 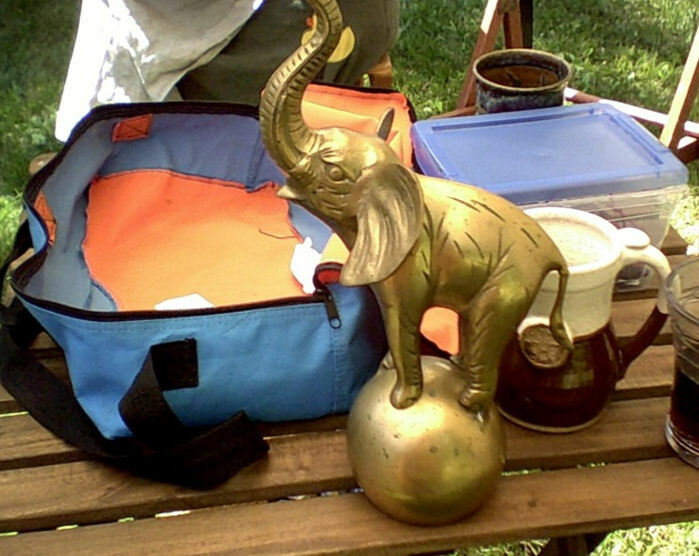 The winner of the tourney takes home the Official Northen Oaken Baroness’s Bocce Tournament trophy, and must return the following year to defend it. At the Bocce tournament, I met The Bookie. You could bet bling (no real money!) on nearly any event occuring at Northern Oaken. What time it will start raining, the winner of a competition, the round a specific competitor is eliminated, the number of kills a specific fighter makes, etc. The Bookie will take any wager you can think of and decide on your odds. Winners are paid in NOWM pewter coinage. I wagered a spoon ring on myself to win the Bocce tournament and got 11 to 1 odds, as there were 12 competitors. Alas, personal wealth was not to be mine. Bling bet and lost becomes Royal Largess. At the Bocce tournament, I also met a Midrealm celebrity. 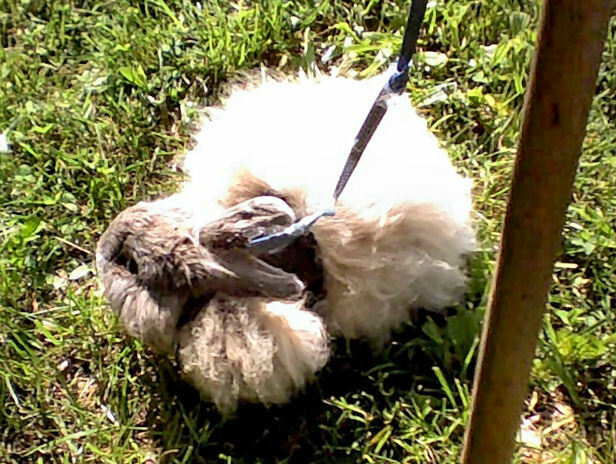 Fizzgig is a Giant Angora rabbit. It’s hard to tell from the picture, but he’s the size of a miniature poodle! Not only does his mistress brush him daily and use his fur to spin, but he is also a Registered Therapy Animal and goes to senior citizens’ homes where he sits quietly on laps and lowers blood pressures. He also has his own Facebook page, so his fans know where to meet him in person. For refreshment during the day, The Pierogi Hut open for business with standard hot dogs, hamburgers, cold drinks and the house specialty, three potato pierogis with fried onions and sour cream for only $3. I’ve eaten more pierogi this past weekend than I have in the past six months. Excellent pierogi! 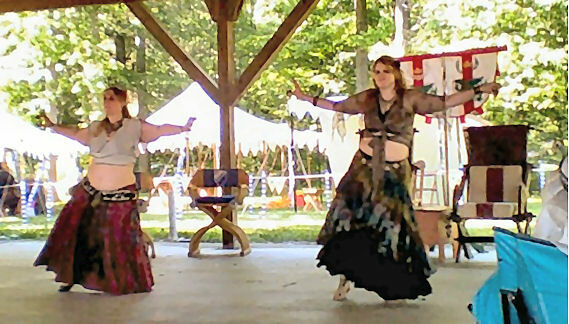 As daylight faded and people started to gather in the main pavilion for court, we were entertained by a Middle Eastern dance troupe and by several bards including a few former Royal Bards. Court was announced and Their Draconian Majesties entered followed by Their Excellencies of Cleftlands and their respective entourages. Court was brief and amusing. This weekend was National Doughnut Day, so Their Majesties, Ragnvaldr and Arabella, thoughtfully provided a tray heaped with doughnuts. Anyone who had business before court or was called into court was encouraged to take a doughnut back to their seat. After court was the 6th Annual NOBLE (Northern Oaken Bardic Lagniappe of Excellence) Cup Bardic competition. 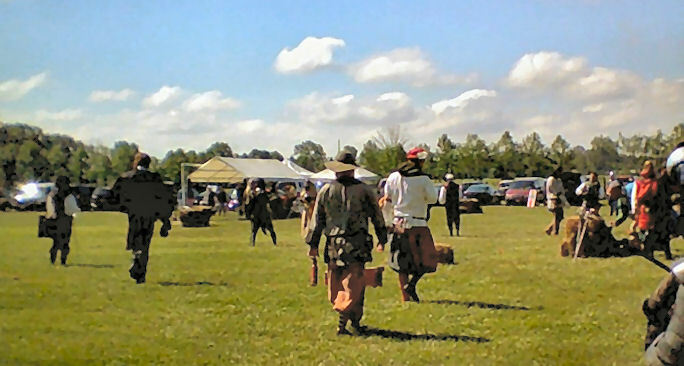 Each barony and shire was invited to send forth their best bard to compete. This year’s entrants included Lady Jolicia att Northclyffe for the Barony of the Cleftlands, Nagasani for the Shire of Rivenvale, Aron Stark for the Barony of Red Spears, and Lord Donalbane of Blakmer for the Barony of Brendoken. Each performer gave two performances., which ranged from Shakespeare recitations to songs to instrumental performances to period stories to “No ****, There I Was” tales. The judges consisted of Lady Kateryn Draper, a Midrealm Bard; myself, as an out-of-kingdom bard; and Lady Elizabethe Alles, last year’s NOBLE winner. After long discussion, the prize was awarded to Lady Jolicia. THL Brendan the Bard led the crowd with song and story, both solemn and silly, clean and bawdy. Things quieted down in the wee hours, so gentles not at the tavern could sleep. Conversation continued far into night, until one by one, gentles retired to their beds. Sunday morning was breakfast at the Breakfast Tavern, a few minor purchases from merchants staying open til the last minute, then breakdown of personal gear as well as event locations and final farewells before hitting the road. I can’t wait until next year. All photos by THFool Dagonell the Juggler. Thank you for the correction! The article has been revised. 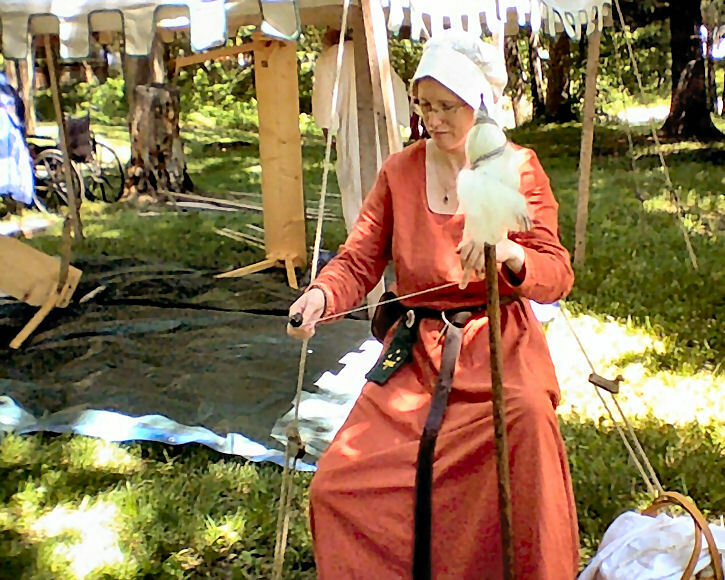 The lady spinning wool with a distaff is Lady Sorcha brecc ingen Donnchada, the fellow processing flax is THL Brendan, amusingly mentioned in the next image teaching a class. For those interested; we had over 50 gentles on the archery range throughout the day! The Bocce Tournament winner is Hakon Hrafnsson of Rivenvale and the lady in the background behind him is Nagasani, one of the bards in the NOBLE cup competition. 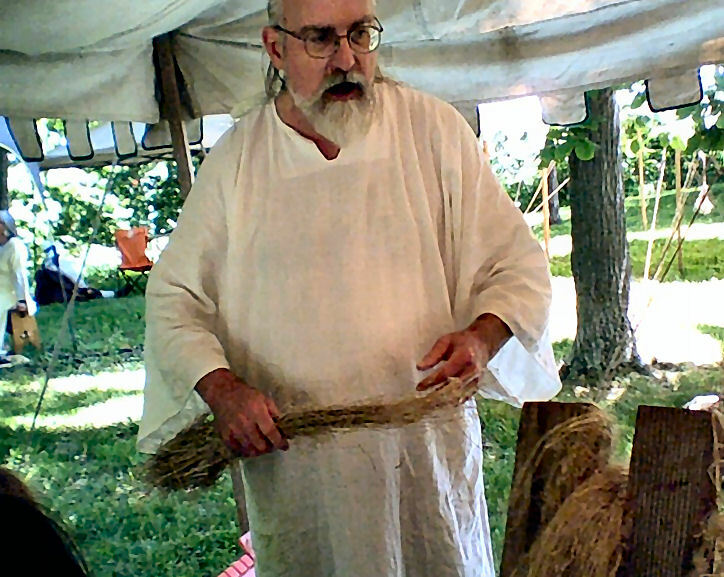 And Brendan has confirmed that is him teaching flax. Gentles, my apologies for the omissions, and my thanks for the corrections. Hello! I am Black Angus owner of Valhalla’s Anvil! The name on the picture of the blacksmith’s description is wrong. 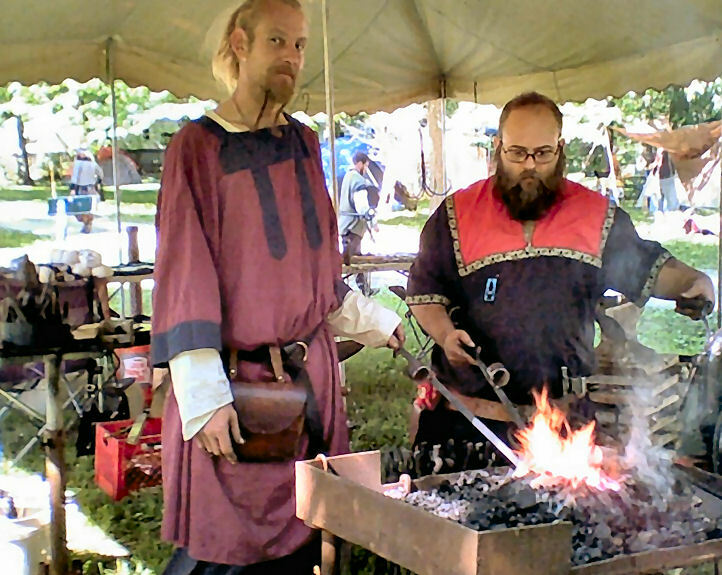 These blacksmiths are not me and that is not my set up. I also did not bring my forge set up with me to NOWM this year.